Take Ottawa with you. Luggage tags available at Drake General Store. All photos by Kenneth Ingram. 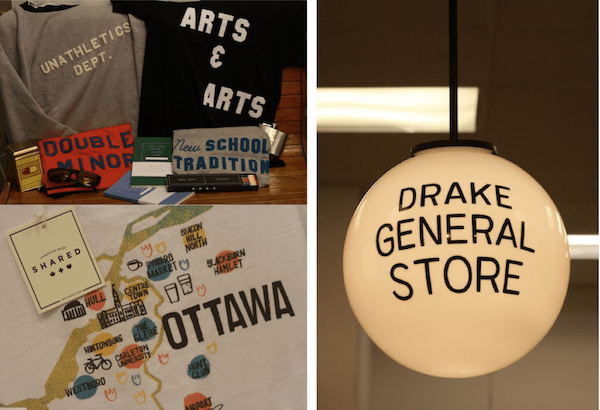 Browsing through the new Drake General Store feels a bit like stumbling upon a small (but friendly) UFO that landed in Ottawa. 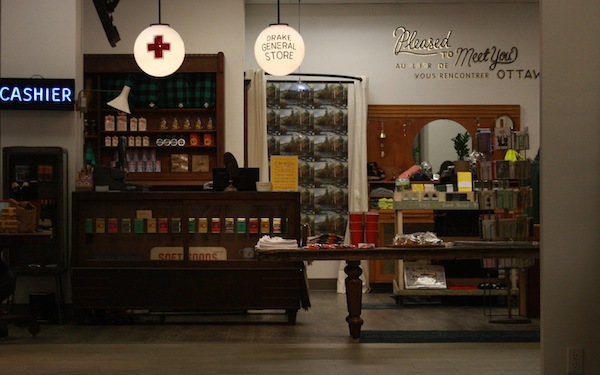 Located at the Rideau Centre, the Drake offers a diverse selection of novelty items including some that are made in Canada and Ottawa-centric. This is particularly good news for shoppers who frequent the Byward Market area and are no strangers to the same tourist t-shirts and souvenirs we’ve seen for years. Outside the Drake’s storefront on Rideau Street, curious pedestrians peer inside while waiting at the bus stop but unless you’re looking for it – the store is easy to miss – buried deep within the women’s section on the main floor of The Bay. Once inside, you’re likely to meet the store supervisor, Sarah Doucet, who consistently proves to be not only extremely knowledgeable about the various product lines but also enduringly enthusiastic during our brief tour. It’s brand of unisex clothes, Shared, offers a ‘Back to School’ line that is uniquely tailored for underachievers. Doucet notes that the colourful new map of Ottawa, available on white t-shirts and also poster-size paper, is currently one of the store’s best sellers. You’ll also find selections of skin care products; jewelry; accessories such as YOW/613 luggage tags and maple syrup scented candles; housewares and a children’s section that includes baby rattles shaped like…chicken drumsticks. For shoppers who get a rumble in their stomach after shaking the shrink-wrapped baby rattle, Drake’s shelves also stock food made exclusively in Toronto by chefs for the Drake Hotel. A walk through the store and its antique décor is an Ottawa-must but if you can’t wait, the Drake also offers shopping online. Drake General Store is located at 73 Rideau Street. For store hours and information, click here.